"'We come and go, but the land is always here. And the people who love it and understand it are the people who own it—for a little while.'" Published by Houghton Mifflin Co. on June 28, 1913. Published by William Heinemann in August 1913. Published by University of Nebraska Press in 1992. Edited by Charles Mignon, Susan J. Rosowski, and Kathleen Danker. Historical Essay and Explanatory Notes by David Stouck. Published in Philadelphia Record on August 10, 1913 and collected by L. Brent Bohlke in Willa Cather in Person: Interviews, Speeches, and Letters. 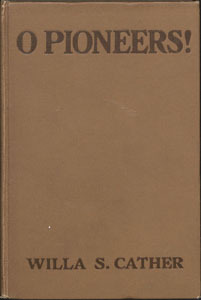 Cather's Use of Genius in O Pioneers!